One main part that our hunting clients really enjoy about Bad River Bucks & Birds is our hunting lodge and bunk house just north of Draper and Murdo, and south of Pierre, South Dakota. Be sure to view our virtual tour! If you are driving East on I-90 turn North at Murdo Exit 192 and turn East at US HWY 16. Go 7 miles to Lincoln Road turn North for 8.25 miles. 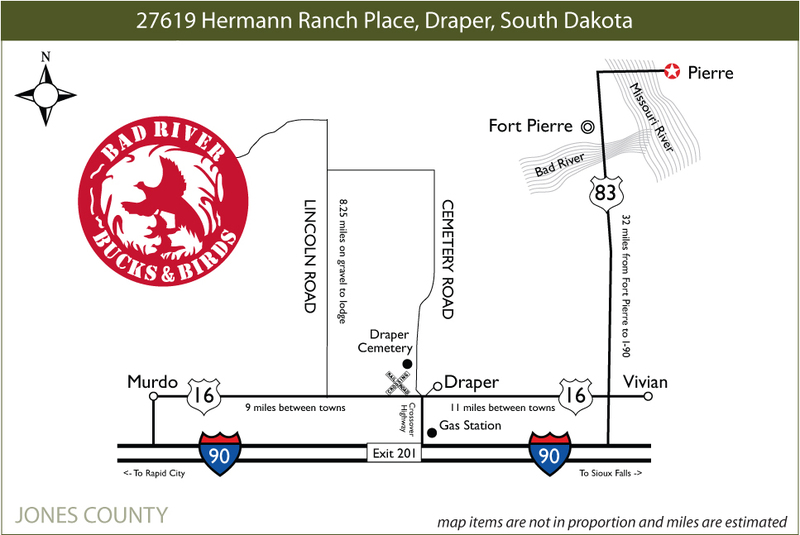 If you are going West on I-90 turn North (right) at Draper Exit 201 and turn West (left) at US Hwy 16. Go 2 miles to Lincoln Road turn North (right) for 8.25 miles. You can also fly into the Pierre Regional Airport and we will pick you up at the airport. Click on map below for a larger printable version. Sign up to receive Bad River Bucks & Birds news and hunt specials.